Outfielders spending some time in goal was a more regular occurrence back in the days of one or two substitutes. Therefore, it paid to have a decent keeper amongst your outfield ranks, and Niall Quinn was so good between the sticks that he was Ireland’s third choice keeper in their Italia 90 squad. A year later, he’d just headed Manchester City in front against Derby County when his keeper Tony Coton was given a red card after taking Dean Saunders down in the penalty box. 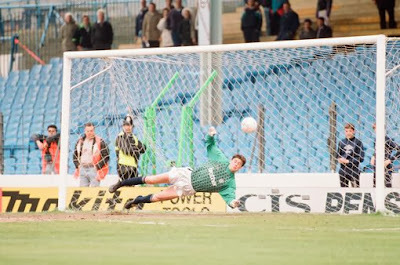 Alan Harper immediately tossed the gloved to the Irishman, who barely had time to don them before making a sensational save from Saunders’ subsequent spot-kick. City went further ahead before Mick Harford finally netted past Quinn. However, a 2:1 defeat for Derby wasn’t enough with Quinn’s penalty save basically condemning The Rams to relegation. Text originally posted on 'Boylesports.com'.